OpenGL (= Open Graphics Library) is a software interface to the graphic hardware consisting of approx. 250 commands in 2 libraries oglcore and oglutilities. Developed since 1990 by SGI (Silicon Graphics Inc.) for hardware- and platform-independent graphics (aimed at graphic hardware manufacturers and programmers). DirectX is a collection of 10 libraries (see table below) for extreme hardware oriented programming in hardware independent form. Permanent development by Microsoft since 1994 (formerly "Games SDK") in ascending version numbers (today: 9.0c). Goal: Windows as platform for multimedia. Nearly all graphic-, sound-, radio-, video-, TV-boards are bundeled with DirectX driver software. The DirectX libraries are fundamentally differnt from all other Windows-APIs (Application Programming Interfaces). They do not guarantee any execution. The programmer has to find out whether the DirectX-programmed hardware exists on the target machine and if yes, what could be done with it. In practice the quick-and-dirty programmer pins his hope on the DirectX hardware driver. The hope is that the driver is good enough not to simply deny an indigestible call via DirectX, but to dispose of a detour via normal Windows libs (see HEL below). Prof. Miszalok's Course C_3D_MDX bases on this hope too. OpenGL consists of two graphic libraries whereas DirectX confederates 10 libraries which all bypass the operating system and access the hardware directly and dangerously. These libraries are wrapped by managed DirectX namespaces. The first four of them deal with graphics. Modern graphic chips contain several cascading autonomous graphic processors which are arranged in form of a pipeline (= bucket chain). The first half of the processor chain is occupied with vector graphics, the second with raster graphics. The command chain of OpenGL and Direct3D mirrors the processor chain of the graphic chips = GPUs. Thus about half of the OpenGL and Direct3D functions are vector functions und half are raster functions and some are mixed. The fundamental differences between vector- and raster graphics are veiled and hidden in order to spare the programmer the problems of vector to raster transformation. The programmer is also shielded from all problems of division of labor between CPU and graphic board, as from all technical differences between the various types of graphic chips. With all this comfort, beginners don't need much hardware and raster graphics knowledge. Direct3D Pipeline: The pace of picture generation by Direct3D follows the architecture of GPUs. In DirectX you can switch off the complete vector graphics part of the GPU with the flag CreateFlags.SoftwareVertexProcessing in the constructor of Device. In this case and/or if the graphic board or the mother board have no or not a complete GPU, OpenGL/DirectX simulates the pipeline inside the CPU. Then the terms vertex shader, T&L engine, HSSL/Cg programs give no sense any more and should be replaced by CPU-based graphics, see below chapter HEL and HAL. Tesselation: Produces triangle grids from polygons and refines a coarse triangle grid. Vertex Shader = Pipeline of micro processors inside the GPU. Modern GPUs contain up to 8 such pipelines in parallel. The meaning is ambiguous: A program written in HLSL or Cg to be fed into a Vertex Shader is called Vertex Shader also. b) 3x3 matrices (f.i. device.Transform.View = Matrix.LookAtLH( new Vector3( 0f, 0f,-4f ), new Vector3( 0f, 0f, 0f ), new Vector3( 0f, 1f, 0f ) );). Back Face Culling: approx. 50% of the triangles show their back sides. Removing them accelerates all following raster operations to double speed. Pixel-Shader = rasterizer = special processors downstream of the vertex shaders, specialized on raster graphics = textures and rendering of singular pixels, programmable with HLSL or Cg, graphic chip contains up to 32 parallel pixel shaders. BitBlitter = abbrev. Bit Block Transfer = externally rendered characters, lines, rectangles, ellipses etc. With the installation of a driver of a graphics board, sound board, joystick etc. the driver embodies itself in the operating system in form of a specific Device Driver Interface DDI. With the help of the appropriate DDIs each DirectX library initializes a Hardware Emulation Layer HEL and a call-identical Hardware Abstraction Layer HAL. 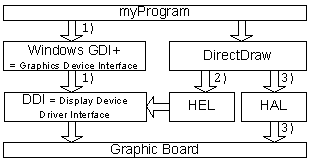 HEL contains the low-level calls of basic functions and CPU-code, HAL the calls of external, autonomous micro programs of the graphic board, sound board etc. HAL has priority in front of HEL, but all library calls are executed via HEL in case HAL does not work. HEL animations, HEL audios, HEL videos etc. used to be awfully slow. But CPU manufacturers as Intel or AMD fighting against the graphic- and multimedia boards improve the graphic and sound power of their CPUs and the architecture of busses and empower HEL vs. HAL. They have limited success but many today users just playing simple games and simple multimedia do not necessarily need dedicated hardware. Modern on-board graphic chips = computers without graphic boards, video memory and HAL execute DirectX programs at sufficient speed for normal office applications. 1) normal Windows instruction without DirectX uses GDI+ and DDI. 3) is faster than 2) and 2) is faster than 1). If call 3) exists, 2) is closed. Its possible to mix GDI+ and DirectDraw statements in any order. Caution: Not fully developed and buggy graphic drivers often install an incomplete DDI and/or HAL which depreciates a good graphic hardware. The class Device just has the driver as only knowledge source about the hardware and just uses the features described by DDI and/or HAL. Recommended: Check in the Internet with the manufacturer of your graphic board whether there is a newer driver and install it. 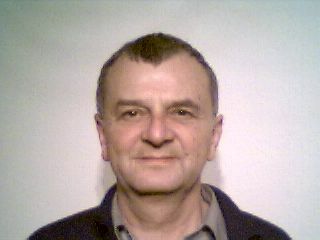 is the most important Direct3D class, it mirrors and manages the graphic board hardware and the current software canvas. The most visible method Device.Present shows the scene on the monitor by flipping the BackBuffer of the graphic board to FrontBuffer. The class contains properties/methods for vector graphics (i.e. Viewport, VertexFormat, Transform) and for raster graphics (i.e. Material, Texture, adresses and lengths of the output buffers). 1) The user changes the window size of the program with the mouse: OnResize-Event. 2) A screen saver takes over the graphic board exclusivly. 3) The Windows operating system takes over the graphic board exclusivly. 4) CPU or graphic board change to standby power saving mode. 5) The cover of the notebook is opened or closed. The samples of Course3DCis solve problem 1) by initializing Device inside the OnResize()-EventHandler. Important Properties of Direct3D class "Device"
DeviceCaps Gets a struct representing the capabilities of the hardware; this is the property to query when you want to know whether the hardware supports a particular feature that your application may require. Viewport Gets/sets the rectangular rendering region on the device canvas. Material Gets/sets the material to use in rendering. Lights Gets the collection of lights that can be activated for rendering. RenderState Gets the collection of render states that are used to control the different stages of the Direct3D pipeline. VertexDeclaration Gets/sets a description of the vertex format being used with a vertex shader. VertexFormat Gets/sets a description of the vertex format being used with the fixed vector pipeline. Important Methods of Direct3D class "Device"
BeginScene Prepares the device to render a frame of primitives. EndScene Tells the device that all the primitives have been rendered for a frame. Clear Clears the viewport in preparation for another frame to render. line 3: Enumerate all available SupportedDisplayModes. line 4: Append a line to text s: Format-string + blank + RefreshRate-string + carriage return + new line. Such initialising is necessary upon any window resize (OnResize event) because Device is lost. line 2: Do not use full screen. line 3: Switch off SwapEffect. line 4: new Device: order the necessary memory space and fill it with prededefined and some self defined properties. line 1: Clear the BackBuffer canvas. line 3: Draw the teapot on the BackBuffer canvas. line 5: Flip BackBuffer and FrontBuffer.